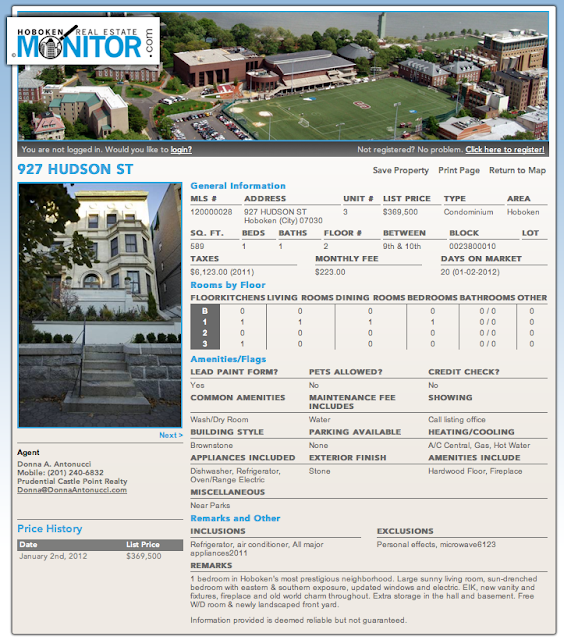 I am very proud to present The Monitor Listings Search Engine..... Fueled by the Hudson County MLS and augmented with data from Hoboken Real Estate Monitor.com, it's the most comprehensive real estate database in Hudson County. 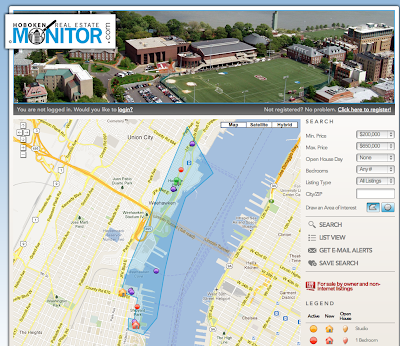 www.search.hobokenrealestatemonitor.com/map/ Here is the link to the map directly. Bookmark it! By watching when listings come on the MLS feed and tracking price changes, my engine offers price history information which is not available on sites like Trulia, Zillow, etc. Understand the mind set of the seller. Are they ready to sell? Have they tested the market and reconciled with what their place is worth in today's market vs what they hoped to get for their place? We also calculate the number of days on market. See lower left for price history. Notice days on Market, Taxes and HOA are included in our listing details. I also offer tax information. Trulia and Zillow do not provide tax information. My info is augmented with the latest tax information on a property. Also included is Home Owners Association dues information. This may or may not be provided on Trulia and Zillow - only if it's manually updated by the agent or owner. Is it accurate on Trulia and Zillow? Trulia and Zillow has no way of validating any of the information entered by agents or owners. It does not come across from the MLS feed. Understand the real costs for a given property. What will your monthly payment be exactly? Does it fit your budget? The new tool allows you to sign up for alerts. Whenever a new property comes on the market that meets your search criteria, an email alert will be sent to you. You can save your favorite properties and multiple searches. Search using the outline tools..... Are there certain streets and neighborhoods you are interested in and you don't want listings outside that area? Do you want a certain area that cuts across zip codes and towns? Use the mapping tool to outline the specific area of interest. You will only get listings within that area and you can have alerts set up based on that area of interest. Also on the map view, colored icons differentiate between different types of listings. 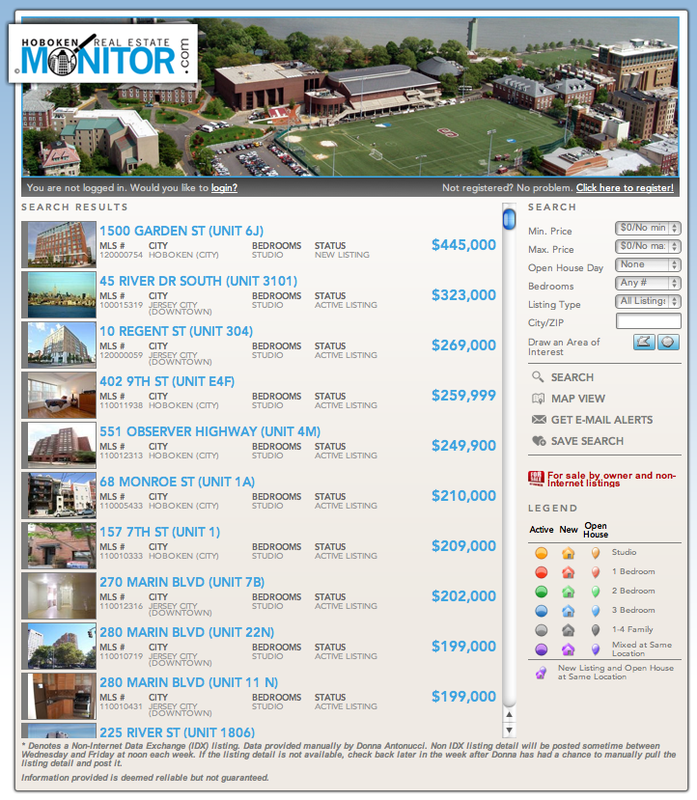 Each week we'll update the map to show which units are having open houses, which are new to the market. 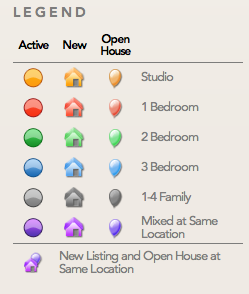 Open houses will be marked with the now familiar balloon icon colored by the number of bedrooms or property type. Are you planning on a day of house hunting? Search the open houses by day, print flyers and a summary sheet to guide your day of shopping. New listings are differentiated with it's own "house" icon so you can quickly find what is new to the market. All other active listings are identified with circles colored by the number of bedrooms. The search engine covers both sales and rentals. To isolate rentals from sales, put in an appropriate price range and hit enter or use your mouse to click on the search icon. Your results can be viewed as icons on the map or in list view. Click on the icon on the map or the individual property on the list view to get to property details. If a property is not listed with the MLS, it will be indicated as such. Understand that agents who are members of the Multiple Listing Service agree to data quality standards. Our dues and listings fees support an administration that polices our listings and fines are levied on agents who are found breaking these rules. We have to have pictures that are from the unit and no other. The square footage has to come from a reliable source like the tax records. We must change the status of a listing within 24 hours of closing so you are not looking at a listing that is no longer available and so on. All this means that data coming from an MLS listing is more reliable than a for sale by owner or an agent who is independently uploading a listing to Trulia, Zillow, Craigslist, etc. Any non-MLS listings on my search engine are clearly marked so you know what you are dealing with....caveat emptier. This is only phase one. We are diligently working on more exciting features, so stay tuned. Please sign up and feel free to send what ever feedback you have about what you like and don't like. I love hearing from my readers.